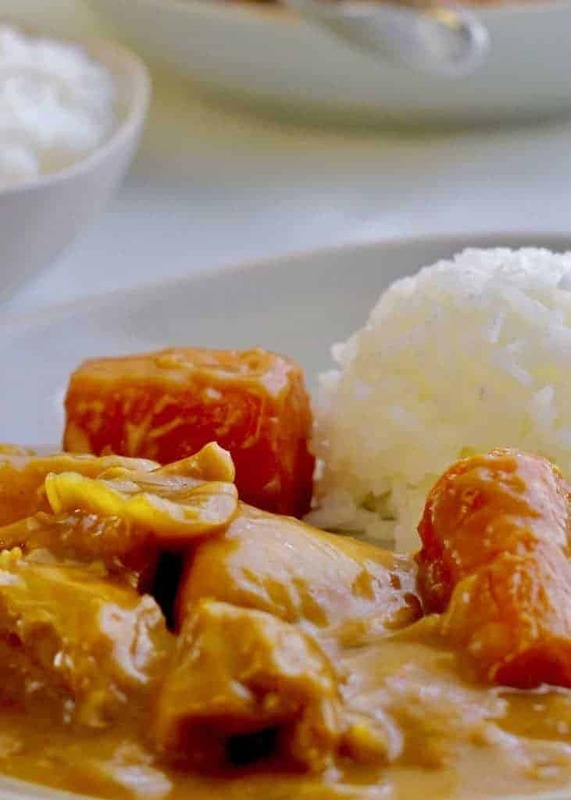 Make a quick but authentic Japanese Chicken Curry in your Instant Pot. Just four minutes under pressure in your pressure cooker for a flavorful and hearty meal. I can’t believe how quickly this came together! 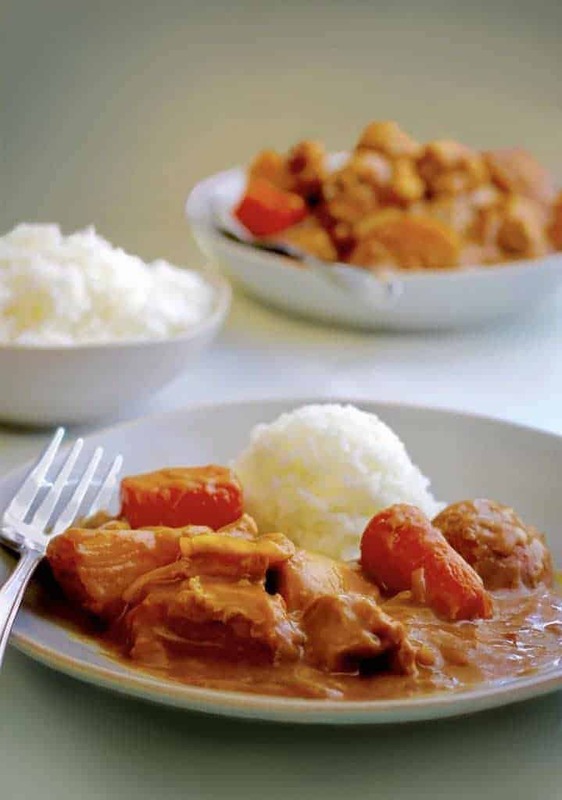 This recipe is for the easiest, most authentic Instant Pot Japanese Chicken Curry you will ever make. One of the really nice things about having a Facebook group where people can post their favorite recipes is that I get to learn from other people. Nancy Moss told us about a Japanese curry and I was so excited about this that I lost no time in ordering the ready-made Curry Paste that I needed for it. Although I ordered one that said Medium Hot, this was not even remotely hot. This means that it would make an excellent, family-friendly meal. The curry has a bit of a sweetness that I think will really appeal to kids. One thing that I did a little differently from other recipes I saw out there was that I cut the chicken into bite size pieces, and cooked everything all in one go. This meant that I could throw together chicken, carrots, potatoes, and onions, and cook all of it for 4 minutes under pressure, which makes for a super-quick dinner. If you’re looking for more great curry recipes, check out my Basic Indian Curry recipe! 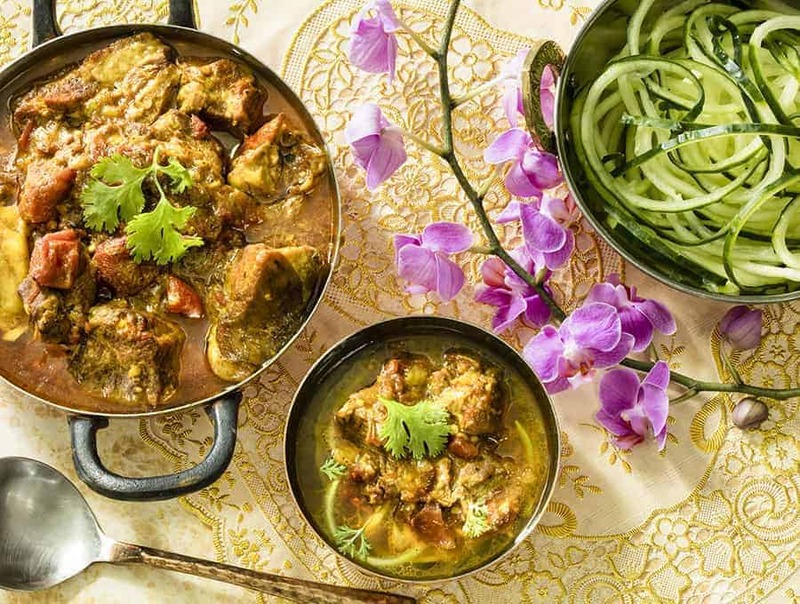 It’s a savory Indian comfort food that you’ll fall in love with. Another fantastic curry dish is my Jamaican Chicken Curry. It’s authentic, spicy and done in just 20 minutes! 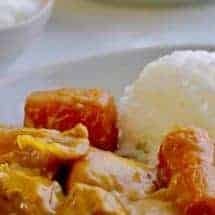 As you can see from the picture below, everything in the Japanese Chicken Curry cooked perfectly, with the carrots and potatoes done well but not mushy, and the chicken cooked tender but not shredded. ★ Did you make this recipe? Don’t forget to give it a star rating below! Just click on the stars in the recipe card to rate. Make a quick authentic Japanese Chicken Curry in your Instant Pot. Just four minutes under pressure in your pressure cooker for a flavorful and hearty meal! Add all ingredients except the coconut milk into the inner liner of your pressure cooker. Place the curry paste on the top to prevent scorching. Cook on high pressure for 4 minutes, and then release pressure quickly. Stir well and mix in the coconut milk, stirring until well incorporated. Serve with rice or noodles, or with a side salad. I am not a registered dietician or nutritionist. Nutritional information is provided a courtesy, and can vary depending on the exact ingredients you use. Don’t forget to check out my Instant Pot Fast & Easy Cookbook! This book is full of all kinds of boldly flavored and internationally-themed recipes—Mexican, Thai, Moroccan, and more—with Instant Pot Fast & Easy, fully authorized by Instant Pot. Just like you have come to expect, my recipes will work perfectly every time, and of course taste great too. 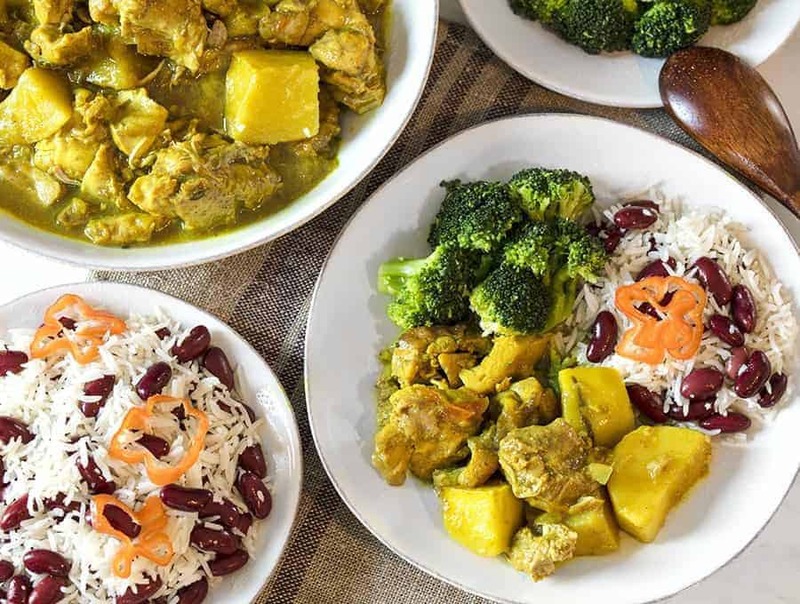 And because these are Instant Pot recipes, dishes like Japanese Chicken Curry, Chinese Steamed Ribs, and Mexican Pulled Pork are ready in a fraction of the time they would take using traditional cooking methods. As with all of my recipes, the focus is on whole foods instead of artificial convenience ingredients, so the recipes are delicious, easy, and healthful too. Welcome! I'm Urvashi and this blog is about global recipes that are often keto, low carb. My recipes are simple to make, but have complex flavors. You’ll find many Instant Pot and Air Fryer recipes here. Start with the Recipe Index to find the perfect recipe for YOU. is there any video tutorial to made it? I’d like to make this with beef instead of chicken. Do you have a recommendation regarding cooking time vs. chicken? Other Japanese beef curry recipes for IP have significantly longer cook times, but I’d prefer the beef keep it’s texture and not become shredded. Thanks! This sounds great and I love your recipes. Any suggestion to substitute for the curry cubes — haven’t seen that in my Canadian neck of the woods — thank you! I have a complaint, this is the BEST and it’s not super low cal, and I can’t stop eating it 🙂 seriously though, this is so good and so stupid easy. I skipped the coconut milk and added that much more water because I’m lazy and didn’t know what to do with the rest of a can of coconut milk. And I doubled the recipe. It is perfect. The vegetables are soft but not mush, the chicken is super tender and moist. I love it and I could eat it for days. I might have to avoid buying more curry cubes so I can force some self control. Thank you! In the top of the page near the bit about sautéing the garlic/ginger it says to use natural release but in the bottom instructions it says to use quick release….which is right? If I want to double the amount would I also double the cooking time? I’m sure it’s good, but I don’t really see how you can call this recipe authentic. My family is Japanese and I’ve never seen Japanese curry made with coconut milk. I’m also confused why people use the instant pot for Japanese curry bricks when it takes just as long as making it on the stove top. I don’t think you should call this curry authentic Japanese, especially when you go on a pretty long rant about all the “wrong” versions of butter chicken in that recipe. I appreciate that your family doesn’t make it that way. I have however spoken to many other families of Japanese descent who live in the US who said this is how they made it. The nice part about recipes is that they change over time and get adapted to different ways of making it, especially as the diaspora expands. I find that the pressure cooker infuses flavor better than stove top cooking and that’s why I prefer to use it. I should also mention I did that in lieu of adding more flour to thicken it. I think that “families of Japanese descent who live in the US” is perhaps where the issue lies. Yes, recipes and styles change ans families blend and become exposed to different styles of cooking. Therefore I would not describe this as “authentic Japanese.” My mother moved to the US as an adult and she would be horrified by the addition of coconut milk to proper curry rice. That being said, i am very new to IP and so I have a question is there a way to PIP to cook the rice at the same time but separately? Yes you can. There’s a video on the butter chicken recipe that shows how I think. You basically place a bowl of rice and water on a trivet on top of the curry and it all cooks very well together. I just want to point out this recipe is tagged as keto! Thought you might want to know so you can fix it. Yes you can! Hah! I’m so glad it worked out. Thanks for letting me know. i was glad to see this type of curry could be made in the IP as this is the type we mostly make. I made it vegetarian using potatoes and frozen mixed veggies. Since I wasn’t adding chicken, I increased the water to 3 cups. Cooked as directed and once finished added cubes tofu to finish. I didn’t need to add coconut milk. It was a nice, thick consistency and beat of all, no pot watching. 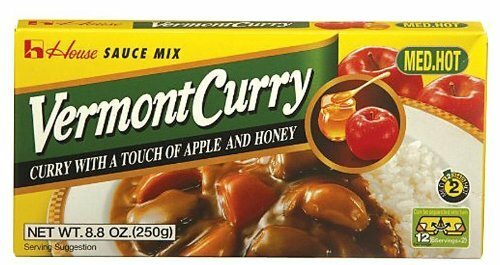 where I can buy vermont curry? This site uses affiliate links. When you purchase using one of these links, we may receive a small commission at no additional cost to you.